Click on a school's icon to view more information. 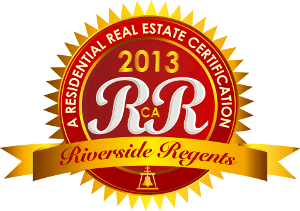 Canyon Crest is one of the largest and most diverse neighborhoods of Riverside. Its diversity is found both in its topography and in its residents. 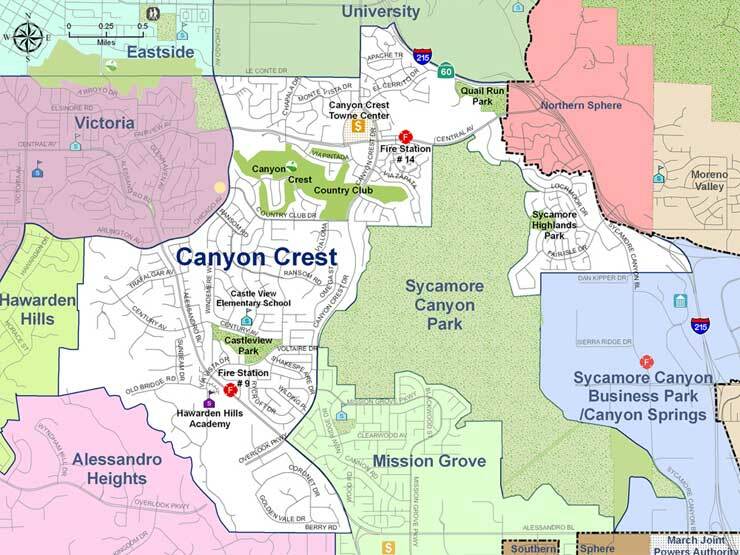 Canyon Crest was formed by six separate land annexations, all of which occurred between 1959 and 1986. Most of the development in the neighborhood reflects modern subdivision design. The land is developed for medium-density residential uses, with some high- and low-density areas included to serve a variety of residential needs. The hilly terrain has shaped development and creates some beautiful views of the surrounding area. The Canyon Crest Town Centre is the economic focus for the area and offers a variety of dining options and convenient, quality shopping for the neighborhood, including the large student population in the nearby apartments. Canyon Crest has its roots in the citrus industry. In 1907, the Monte Vista Nursery was established in the area, which now includes the Canyon Crest Town Centre. This nursery, which specialized in citrus stock, once occupied 200 acres. Two cultural resources within the neighborhood include the William Childs House, a 1910 Craftsman bungalow listed on the National Register of Historic Places, and the locally significant Art Deco entry monuments at University Drive. These monuments were once in place on the west side of the old Buena Vista Bridge, and were moved when the bridge was replaced in the 1960s. Canyon Crest includes the Sycamore Highlands Specific Plan area, which abuts the northeastern edge of Sycamore Canyon Park and is in close proximity to the Box Spring Mountains. These natural features, along with the Tequesquite Arroyo, offer excellent open spaces for outdoor recreation and scenic vistas. The Canyon Crest Neighborhood is well served by public facilities, community parks and schools. New Canyon Crest Fire Station No.14 and Mission Grove Fire Station No.9 proudly serve the neighborhood. Castle View Park includes three acres developed as a playground and 27 acres in natural open space. Quail Run Park is an undeveloped, open space park. Sycamore Highlands Park is a 10-acre neighborhood park serving recreational needs of the residents within the Sycamore Highlands area. This park has spectacular views of Riverside's downtown and surrounding areas and includes access to the many trails within the extensive Sycamore Canyon Wilderness Park. The brand new 30-acre Andulka Park is adjacent to the neighborhood at the intersection of Central and Chicago Avenues. This park includes two new baseball fields, a tennis complex with a pro-shop, two lighted basketball courts, two volleyball courts, restroom and concession facilities, children's playground, picnic facilities, open meadow areas, parking and a walking/jogging trail with a native habitat area. Finally, educational needs are met by Castle View Elementary School and the many public and private schools in adjacent neighborhoods.